Gail is a mother, grandmother, JD and advocate in Kansas City. I recently read a posting on one of the narcissistic personality disorder boards. An adult child of a narcissist asked about how to grieve the loss of her narcissistic mother. The question was answered by someone who, in my opinion, should not have answered. The response was, "You grieve a narcissist parent just like you would grieve for anyone else." As adult children of narcissistic mothers (or fathers), we have heard this kind of response most of our lives. It just seems like one more example of someone who has never experienced being the child of a narcissist failing to grasp the severity of the situation. What a woefully pitiful answer to someone who has undoubtedly already experienced so much pain and is apparently wrestling with her grief enough to post such a question on a public forum. I do not particularly agree with the idea that you should grieve any two loved ones who are not narcissists the same way, let alone the idea that you should grieve a narcissistic mother just as you would anyone else. I am not a grief counselor, but I have lost my narcissistic mother, my grandmother, and my brother in the last decade. I adamantly beg to differ with such a response, which is the topic of this article. This has been my grieving experience if it can in any way be of help to anyone else or provide some validation. While I grieved differently for my grandmother and for my brother, it was at least remotely similar. Someone I loved was gone. I missed them. I remember the good times. However, grieving my narcissistic mother was not even in the same ballpark as grieving my brother and grandmother. First of all, I really did not grieve much for the first year after my narcissistic mother died. As the golden child and flying monkey adult children seemed devastated, a part of me felt guilty that mostly what I felt was relief and numbness. Do not get me wrong, I loved my mother dearly. Perhaps the numbness was my devastation or denial, especially from the realization that even on her deathbed she manipulated, gaslighted, and lied. She was dying, yet her final gesture before stepping into eternity was to give me one last swift kick. The more the realizations struck me, the more her passing began to seem like a gift to me. 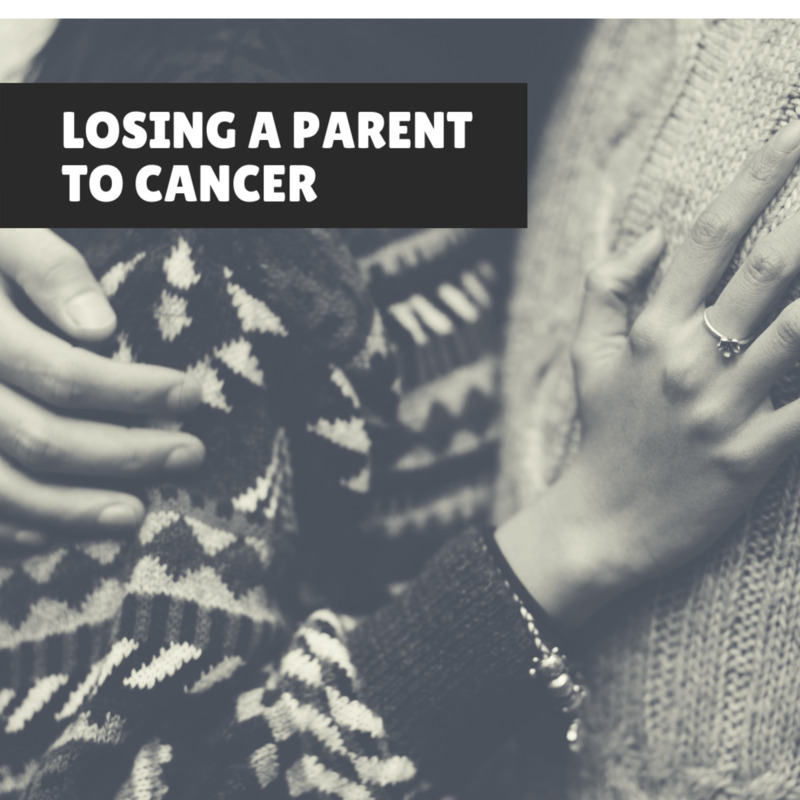 She was no longer suffering from cancer, and there could be no more damage done by her lying, manipulating, scapegoating, ridiculous demands, etc. I went to a therapist for a couple of months a little more than one year after my mother's passing. She pointed out to me that I had been grieving my mother my entire life. So perhaps it was not a lack of grief, but that I had already spent a lifetime processing that grief. That is a very accurate statement. As an adult child of a narcissist in my 40s, I had spent many years grieving for everything my relationship with my mother was not. 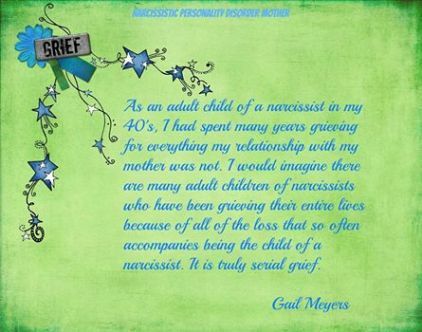 I would imagine there are many adult children of narcissists who have been grieving their entire lives because of all of the loss that so often accompanies being the child of a narcissist. It is truly serial grief. Secondly, I realized what I was actually grieving was not a real, two-way relationship as I grieved with my brother and later my grandmother. To a great extent, I was grieving the shattering of what remained of the illusion of having a mother just like my therapist had told me decades earlier. Thirdly, I grieved the loss of the hope that she would ever change, that she would ever be a mother who loved me. I thought I had given up that hope many years ago, but it became obvious somewhere deep down inside the little girl in me was still hoping. Along with that was the realization that she never admitted the truth, let alone ever apologized for any of it. When she died there could be no more hope of change or resolution. This is the hope that some have called a "toxic hope." Next, the anger and rage began to just gush out of me. When I say gush, I do mean gush. As I looked back over my childhood, it was clearer than it had ever previously been. She knew about the sexual abuse. She not only felt no responsibility for failing to protect me but had the audacity to blame me for it. She would even taunt me as a child when I attempted to protest the abuse by sarcastically saying, "poor Gail." She continued that well into adulthood, as well as during her illness. Then the jealousy, gaslighting, backstabbing, silent treatment, ostracism, verbal abuse, slander, manipulation, scapegoating, etc., as an adult. 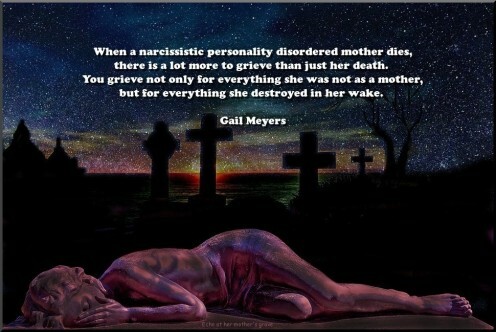 When a narcissistic mother dies, there is a lot more to grieve than just her death. You grieve not only for everything she was not as a mother but for everything she destroyed in her wake. I grieved the loss of reputation, family, numerous relationships, years of turmoil and deep emotional pain. I grieved the total absence of any remorse or attempt at resolution by her during her two years of terminal illness. At one point I even whispered in her ear that I forgive her and I hope she forgives me, too. She did not even respond. In retrospect, I honestly believe her mind was on the preservation of her image after her death, as crazy as that may sound. I grieved the fact that there was a human being walking around on this planet who could inflict so much merciless devastation, and on her own children, without batting an eye—ever—and yet, still have so many deceived, or at least defending her fabricated martyr tales. I experienced strongly conflicting emotions. She was my mother. Mothers should love their children and children should love their mothers. Yet, the wide, deep, lifelong trail of destruction reveals the truth no matter how hard the surviving flying monkeys work to contain it. 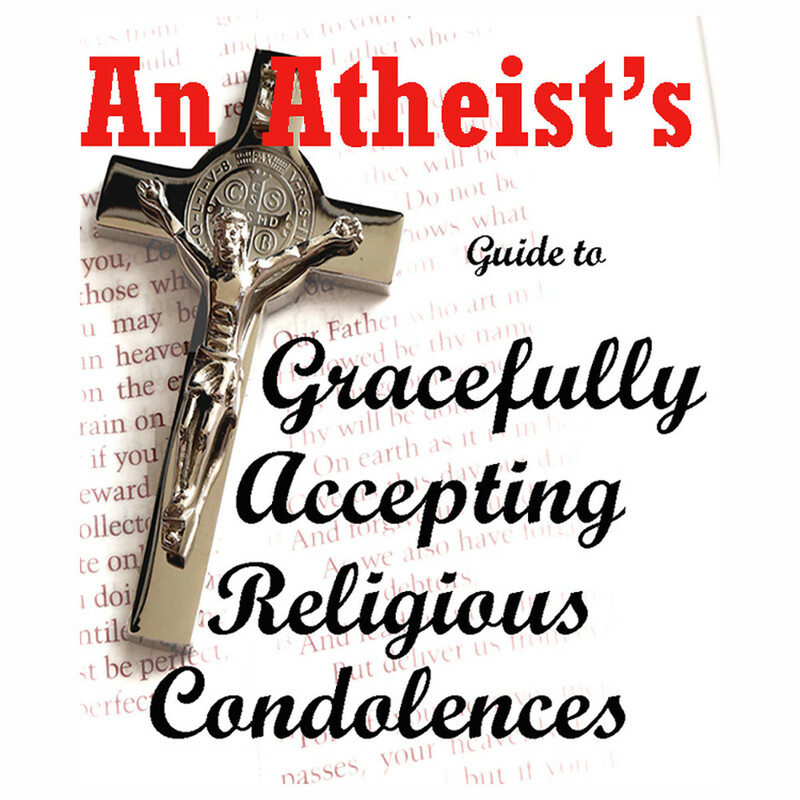 Did I experience any of this while grieving anyone else? No, I sure didn't! The flying monkeys worked hard to contain the truth even after her death. There was no question in my mind at this point that most of them do it knowingly, but some could possibly do it out of ignorance. 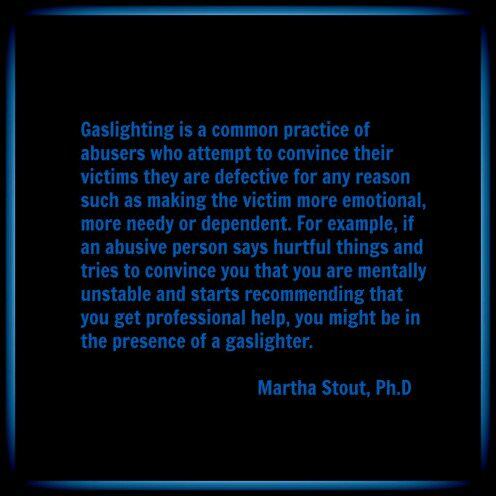 Meaning, they may unknowingly become a narcissist's flying monkey and inadvertently inflict their abuse by proxy, but even so, it is just one more reason to go no contact. This is one of the best books I have ever read. The late Dr. M. Scott Peck was a practicing psychiatrist of more than three decades when he wrote People of the Lie. Dr. Peck argued that there exists a category of conditions that psychiatry is ill-equipped to handle, the human evil of malignant narcissists. The destruction malignant narcissists can cause is only limited by the amount of power they are able to obtain. He then gives case study examples of such human evil, escalating in power, beginning with manipulative narcissists as parents, and ending with Hitler. People of the Lie is not a light read, but for those who are ready, it is a fascinating book full of validation for the adult sons and daughters of narcissists. There was a mobbing by my siblings and their spouses except for the golden child, 6-to-1, led against me by my narcissistic sister, in front of my child, after my mother's death. It was complete with ridiculous accusations. In the following months, I was verbally assaulted by three different flying monkey relatives. I would not go along with their fictitious version of the late narcissist, as the flying monkey spewed her slander and grief on me. Please note, I was not expressing my own grief or anger to her, but she was expressing her grief to me. It might truly sound amazing to the average person, but certainly not to the adult child of a narcissist, that in each case the flying monkey was angered by my response, then immediately proceeded to attempt to tell me what I should think and feel. When I say they were angered by my response, I mean my unwillingness to agree or display emotions in direct opposition to reality and my feelings, in response to their absurd assertions. Extended family flying monkeys treated my late brother horribly during our mother's illness. At times he was even told to leave our mother's house because it was their day to visit. Being treated like a piece of trash, caused this exchange to escalate into a confrontation. He was told by our mother, as he cried at the side of her deathbed, to just go home if all he was going to do is cry. This was in direct response to her years of slanderous martyr tales resulting from him attempting to hold her accountable and having the ability to expose her. Then, the gossip by the flying monkeys was that he was not visiting her much, which they seemed to make nearly impossible for him, but it was obviously because he must feel so guilty for treating his mother so poorly! In other words, they flipped it and claimed that he must be weighed down with guilt when she was the guilty party. I heard a bit of that same line directed toward me with them also making it as unpleasant as possible to visit at times. It infuriated me because I had not treated my mother poorly, she had been abusive for years. Even though my sister were both married housewives with husbands who paid the bills, and I was single, working full time and raising my grandson, we were each to take turns taking care of our mother 24/7. So, I was expected to spend 8 hours every day taking care of my mother, work 8 hours or have my paycheck docked, take care of my grandson, help my grandmother, and somehow sleep in there somewhere. Narcissists love to rewrite history. Then, not only tell outlandishly ridiculous lies with a straight face but convince others of their fables. It is astonishing to me to this day how well her routine of playing the victim while vilifying the true victims worked. It is what I have previously called the flipped tale. She had people giving various negative responses to the scapegoats in an effort to defend her when she was consistently the ruthless aggressor! For example, the statement was how badly my late brother must have felt for the way he treated our mother. In reality, our late mother had spent two decades destroying him with slander because he confronted her about knowing about my childhood sexual abuse, doing nothing to protect me, then actually blaming me for it, having jealous rages, and attacking me for it many times. It was the typical narc maneuver of playing the victim while vilifying true victims. She ultimately managed to make herself the victim, even in that. Later in life, he continued to defend his boundaries and attempt to hold her accountable for her unacceptable behavior. What my late brother actually did was call our venomous narcissistic mother on the carpet for her abuse, lies, treating his wife poorly, etc. He also saw the truth and had the character to stand up and confront his narcissistic mother when he was still a teenager. So she spent the rest of her life destroying my brother's family relationships, reputation, and mental health in order to conceal the truth about her own character and return to her coveted victim role. She spread martyr tales about how she was the innocent victim of her vicious son when the reality was the exact opposite. He may have confronted her aggressively, and no, he did not strike her, the intensity was outrage and righteous indignation for what she was trying to pull. She was the vicious aggressor he was trying to stop, and he was the victim for the rest of his life after confronting her. She did the same to me, the slander just had a different twist to it. If I was dealing with a narcissistic personality disordered person today, I would probably use those accusations toward others as nearly precise indicators of the truth about the narcissist. What I think she was doing is projecting her negative traits and feelings onto me, her scapegoat. She would often accuse the victim of the very thing she was doing, but she would also put forth fabrications. In any case, the flipped martyr tale gives the appearance of stripping the narcissist of their wrong and the victim of their virtue, all wrapped up in one smooth, disgusting little maneuver. 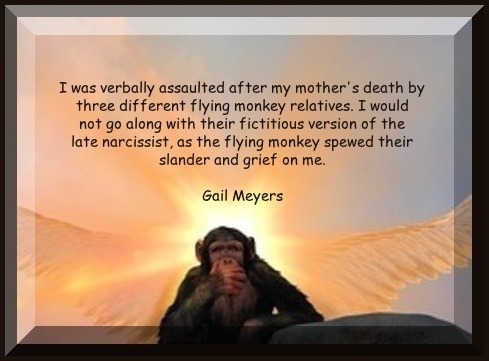 The grieving flying monkey was promoting the narcissist's slanderous lies about my brother and I was expected to stand there and agree with the ridiculous fairy tale. Mind you, my brother died suddenly, unexpectedly and very young, only a few months after our mother's death. I nearly went to the grave myself that year. Yet, the flying monkey wanted me to sing our mother's praises and express aversion to my late brother! It was as if she was completely oblivious to the reality of the situation. It was all about her grief and maintaining her late narcissistic sister's facade. 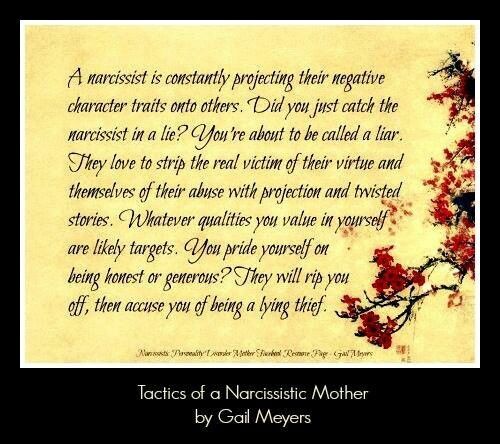 The flying monkeys attempted to cause my grieving to be just as much of a charade as the narcissist's life was. To hell with the scapegoat's feelings, my grief for my brother, the truth of what actually happened, or the actual character of the late narcissist. They are still trying to drag me back into the rabbit hole and did not appreciate me refusing to play along. If the flying monkeys defended the narcissist during her life, their efforts seemed to double after her death. However, I flat refuse to play let's pretend with anyone anymore. She was not the only flying monkey to attack, but I have had the whole bunch of them out of my life for several years now. I do not regret it all. It feels so much better. We all tend to speak more highly of someone who has departed. So then the scapegoat survivor also has the societal taboo of speaking ill of the deceased, and not just any deceased but a deceased mother, to deal with in order to be able to speak the truth or grieve honestly. There was no bigger relief than getting a therapist trained in narcissistic personality disorder. Did I have this rage toward my brother or grandmother after their passings? Nope, nor do I believe that is the same as the "anger" stage in the five stages of grief. That state might include being angry with the dearly departed for abandoning you or angry with God about the loss, but not the kind of rage associated with the abuse from a narcissistic mother. Most people have some differences in their relationships, but they love each other. You try to remember the good and let go of the bad. You remember the good times, the good qualities over time. Hopefully, the good outweighed the bad. Yet, the relationship with the narcissist is parasitic in nature. When my narcissistic mother died, the maneuvers came so much more clearly into focus. Everything about our relationship was one-sided. I gave and she took. She also took when I did not give. She took regardless, either by hook or by crook. It was all about her regardless of the consequences in my life and often intended to cause me distress or loss. The fact that is was a one-way, parasitic relationship was even more exceedingly clear after her death. After a couple of years of anger and rage, I really started to feel like someone I never really knew was gone. Someone who held herself out as the exact opposite of what she actually was. You truly cannot fault a wolf for being a wolf. That's who he is. He looks like a wolf and he acts like a wolf, but you know he's a wolf. 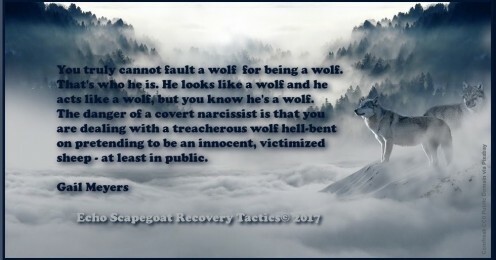 The danger of a narcissist is you are dealing with a treacherous wolf hell-bent on pretending to be an innocent, victimized sheep - at least in public. As my therapist had told me years before, I truly began to deeply pity my mother. When she told me that, I strongly believed the only thing I would ever feel toward my mother was anger because I was still in the heat of the rage. It took processing the anger and allowing it to subside, then I began to see how truly pitiful all of it really was. I think it took me a full five years to arrive at that point. Even now, I can still become angry about it. It's just not the rage it once was and the overwhelming pain is no longer attached to it. So while some act as if your grief should be processed three days after the funeral, and others say one year, I would have to say it took me five years. I am glad I continued to process it in order to come to a better resolution of a lifetime of her abuse. 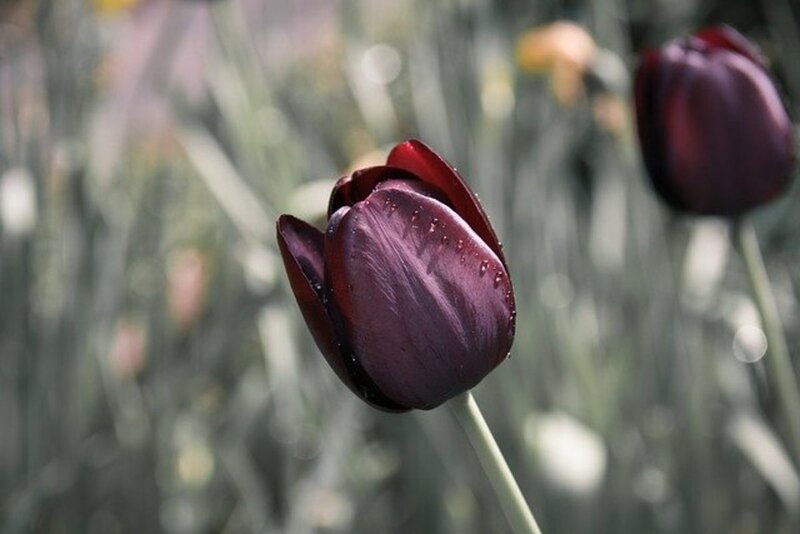 My point in all of this is we all grieve differently and there is generally a whole lot more to grieve at the death of a narcissistic mother than just her passing, e.g., the wide and deep path of destruction and deception she leaves behind. When my narcissistic mother died, I felt numbness, and the relief I wouldn't have to put up with her mean spirit any longer. Three of the aides from the nursing home she had been in came to the funeral and proceeded to harass me. I thought that was her final parting shot to me. But no, my two sisters took up where she left off. I am now no contact with them. The amount of hurt and suffering a narcissist can cause is incalculable. How can I miss someone who was so mean and controlling? I don't, I'm sorry to say. She was what you call a malicious narcissist. I wish I had had the sense to get on a bus and leave the area when I was 18.